First start of by peeling the bark (?) off the ginger and mincing it as small as possible. Once you cut the ginger as small as you can, mix everything together. DONE! Its that simple. Allow to sit for a few hours so the flavors can get to know each other, then if needed use as a marinade or dipping sauce! Looking through my grandmother's recipe cards, I found this card which my grandmother ranted and raved about. Start by laying out all of your slices of bread and removing the crust on them. Then, mix everything but the bread and oil together in a mixing bowl. Once the concoction is fully mixed let sit for several minutes while you heat your pan. In a large pan, pour oil into it and to get hot. While its getting hot, take the mixture and spread it over the crust-less pieces of bread. Once the oil is hot enough, place the covered pieces of bread shrimp side down and allow to fry. Once fully cooked, allow to full cool. It will be hot!! Once cooled enjoy! Food For Thought: Your wasted food could be a little animal's meal! Now, I'm not a big fan of wasting foods.. So that bread you cut the crust off? Throw it outside and feed the animals, or nom on it yourself. You can also use Cheese, and Sourcream. In a medium sized pan, pour a little oil and heat till hot. Add the ground meat to the pan and cook thoroughly with added spices to your taste. Once the meat is fully cooked, remove from heat and allow to sit. Prepare the salad by cutting up lettuce, and onions. Once finished cutting, create a bed of lettuce so you can top it off with corn chips. 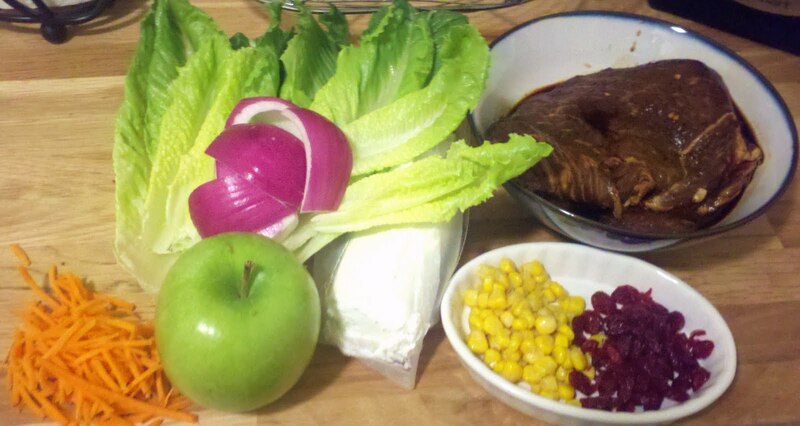 Once the meat has cooled a bit place the meat on top of the corn chip / lettuce bed. Top with salsa, and onions; and enjoy. If you want to add a dressing, a ranch, or blue cheese dressing would have a nice cooling effect if you decide to use a very spicy salsa. 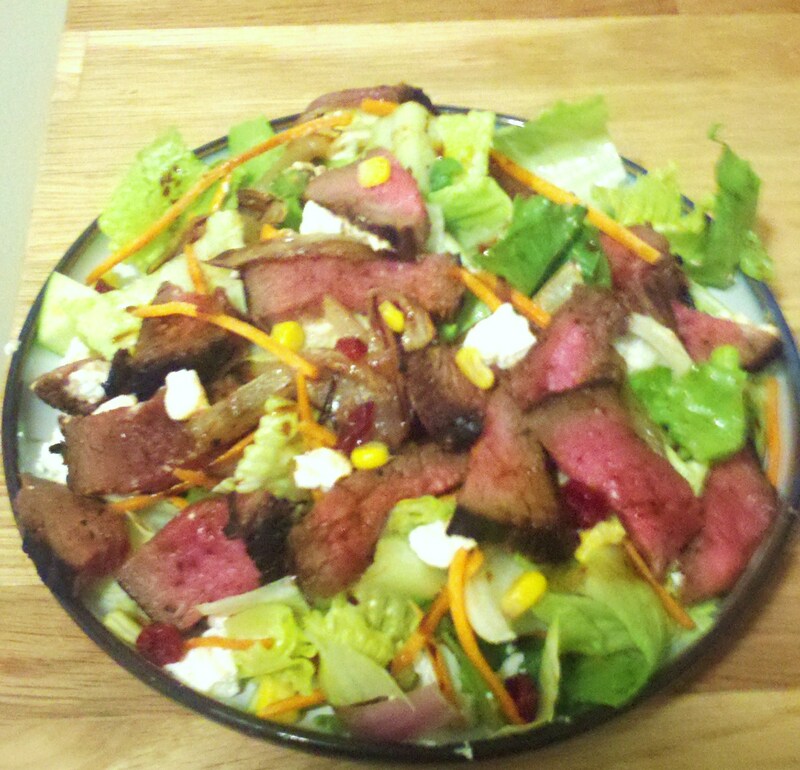 This might just be the best Steak Salad you will ever have...YUMMO!! Start this recipe earlier in the day or the night before by marinating the steak. The marinade is what makes this salad! As mentioned before, marinate the steak overnight. I don't have a grill because I live in an outdoor-less grill hating apartment. So I cook this on the stove in a frying pan. You can broil this too. Heat your pan with a teaspoon of oil. Let the pan get hot and then add the marinated steak. We want the steak to sear and crisp up on both sides. It will hold in the moisture and be nice and juicy. Cook approximately 5 minutes on each side on high heat. After both sides sear, lower heat to medium and cook approximately 10 more minutes on each side, depending on size and preference. In a smaller pan, heat a teaspoon of oil and add your sliced red onion. I don't add any salt or seasoning, because there is enough in the steak marinade. Saute the onion until they become translucent. Slice up your cold veggies, plate them, and keep it on the side. When onions are done, add to the top of your salad. When the steak is done slice it nicely and lay on top of your lettuce and veggies and then top with crumbled goat cheese. And there you have it. Enjoy your healthy, inexpensive, delicious steak salad.